This radar data was collected by a system in Goose Bay, Labrador. This system consists of a phased array of 16 high-frequency antennas with a total transmitted power on the order of 6.4 kilowatts. See the paper for more details. The targets were free electrons in the ionosphere. 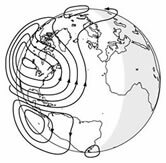 "Good" radar returns are those showing evidence of some type of structure in the ionosphere. "Bad" returns are those that do not; their signals pass through the ionosphere. Received signals were processed using an autocorrelation function whose arguments are the time of a pulse and the pulse number. There were 17 pulse numbers for the Goose Bay system. Instances in this databse are described by 2 attributes per pulse number, corresponding to the complex values returned by the function resulting from the complex electromagnetic signal. -- The 35th attribute is either "good" or "bad" according to the definition summarized above. This is a binary classification task. Sigillito, V. G., Wing, S. P., Hutton, L. V., \& Baker, K. B. (1989). Classification of radar returns from the ionosphere using neural networks. Johns Hopkins APL Technical Digest, 10, 262-266. Glenn Fung and M. Murat Dundar and Jinbo Bi and Bharat Rao. A fast iterative algorithm for fisher discriminant using heterogeneous kernels. ICML. 2004. [View Context]. Predrag Radivojac and Zoran Obradovic and A. Keith Dunker and Slobodan Vucetic. Feature Selection Filters Based on the Permutation Test. ECML. 2004. [View Context]. Dmitriy Fradkin and David Madigan. Experiments with random projections for machine learning. KDD. 2003. [View Context]. Jennifer G. Dy and Carla Brodley. Feature Subset Selection and Order Identification for Unsupervised Learning. ICML. 2000. [View Context]. Colin Campbell and Nello Cristianini and Alex J. Smola. Query Learning with Large Margin Classifiers. ICML. 2000. [View Context]. Marina Skurichina and Robert P W Duin. Boosting in Linear Discriminant Analysis. Multiple Classifier Systems. 2000. [View Context]. Aynur Akkus and H. Altay Güvenir. K Nearest Neighbor Classification on Feature Projections. ICML. 1996. [View Context]. Isabelle Alvarez and Stephan Bernard. Ranking Cases with Decision Trees: a Geometric Method that Preserves Intelligibility. [View Context]. Federico Divina and Elena Marchiori. Knowledge-Based Evolutionary Search for Inductive Concept Learning. Vrije Universiteit of Amsterdam. [View Context]. Christos Emmanouilidis and Anthony Hunter. A Comparison of Crossover Operators in Neural Network Feature Selection with Multiobjective Evolutionary Algorithms. Centre for Adaptive Systems, School of Computing, Engineering and Technology University of Sunderland. [View Context]. Markus Breitenbach and Rodney Nielsen and Gregory Z. Grudic. Probabilistic Random Forests: Predicting Data Point Specific Misclassification Probabilities. Department of Computer Science University of Colorado. [View Context]. Michalis K. Titsias and Aristidis Likas. Shared Kernel Models for Class Conditional Density Estimation. [View Context].